Like all great things, Sharknado Cake just wanted to be loved. 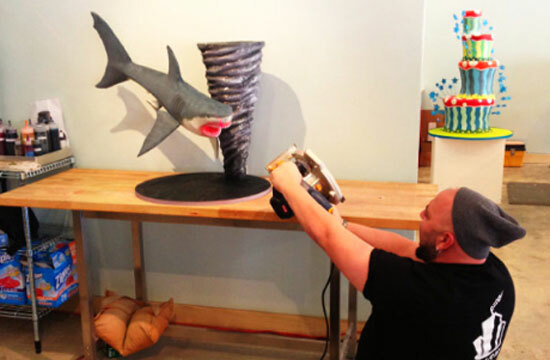 And though it was indeed admired by its creator, Duff Goldman and Charm City Cakes, Sharknado Cake only wanted one thing in life: to be cherished and devoured by a man worthy of a shark attached to a tornado. “This cake is about as cool as you can get, especially since it’s not the easiest thing to come up with a cake that captures sharks in a tornado, but Duff did it,” he told the site. Apparently, as birthday boy Ferrante discovered, one cannot put birthday candles in a Sharknado Cake. Come on, Ferrante! Use the ingenuity that helped you create this movie! With a bit of imagination and some Photoshop warping, one could even put an Umami Cronut on a Sharknado Cake. Anyways, we bet it tasted like chum, seawater, and global warming.